There has always been a mesmerizing factor in Cowboy Junkies’ music that really makes me understand why, throughout their 25-year long career, they have become a cult band. It is the amazing mix of genres following nothing but the almost telepathic relationship among the band members; it’s that change from blues to country, jazz or rock styles, constant jamming and a voice that could give wings to everyone, all of that bundled for our own pleasure, that has haunted my ears since I first listened to them. 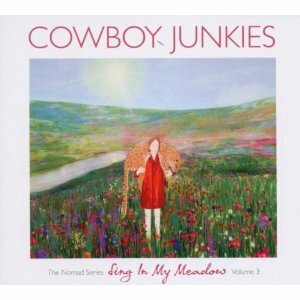 It is in October 2011 (and incidentally 2011 being a year for band reunions and greater expectations) that Cowboy Junkies released their 13th studio album called Sing in my Meadow (The Nomad Series: Vol. 3), which a materialization of the above mentioned going from blues to psychedelic riffs, having no standard structures for each and every song but the complete surrender of reason and senses to the ephemeral tempo of their song. The magic of a band that follows their will and makes their own rules is delivered as well in this album, leading to images of long nights devoted to listening to good music, thinking or just rediscovering your favorite band, like the idea obtained through the expression of ‘Hunted’ (track 6), easily encompassing the night time with psychedelic guitar riffs that could make you repeat over and over again that song, amazing bass guitar work (I’m not sure if it’s the quality of my loudspeakers, but it sounds a little bit obscured, though), and voice that feels like the aerial element of this formula. A special mention to Peter Timmins is expressed at this point, as his drumming deserves a big jaw-drop for guaranteeing a mind-blowing creativity and feeling in every track. There’s no doubt that Cowboy Junkies returned to that initial idea that inspired them more than 20 years ago, as this is a band that keeps music as organic as possible and uses effects just at the right moment, delivering ideas joined in between by brilliant bridges that would seem to be made of pure jamming, as in ‘Late Night Radio’ (track 4). The hint of country style is contained in track 5, ‘Sing in my Meadow’, an amazingly honest track supported by prolonged bass lines in perfect synchrony with the guitar, voice, with a magic touch of harmonica and a somewhat even distribution of sounds (i.e., improvisations are not that prolonged). I love the bass here, as it is still free and creates clusters of sounds proving again its will to do some jamming (the bass guitar sound is clearer here). There’s yet another mind-blowing bridge, as the perfect chance to talk whatever was locked in the musicians’ voices, to then be followed by that magic voice. ‘A Bride’s Price’, the penultimate song, is a full surrender to psychedelic music lines, and the bass line being the compass of other instruments to come back home safe, giving a nice blues structure to your senses. Music notes that fuel a writer’s pen or the will of dreamers to create their own paradise, a moment to lose yourself and rediscover the element that really led you to do what you are doing right now, nourishing your conviction with every detail, reaffirming your will to continue through the path you’ve created. Cowboy Junkies Website. Myspace. Last.fm. Facebook. Posted in reviewsTagged Cowboy Junkies, Sing in my meadows, the nomad series volume 3Bookmark the permalink.